#U2ieTour is, at its heart, about home. 'A place called home' Bono calls, as he answers his own question 'What do you want?' in the Zooropa into Streets segue in recent shows. Home can be defined in many ways, as many things, and fans this year have found a new online 'home' of sorts, a place where we gather as each show has ended, to chat, engage, hang out... The Crystal Ballroom. The Crystal Ballroom is hard to describe. It really doesn’t fit any of the common categories—it’s not a website, it’s not a forum, it’s not a podcast. But it’s also a little bit of all those things. I often tell people its part television, part chat room and part radio call-in show—kind of a mini Zoo TV on your phone. If you’ve never heard of the Crystal Ballroom, that’s understandable. We’re the new kids on the block, about as old as the #U2ieTour itself, which makes it really thrilling to be named the Fan Site of the Week. Thank you, Zootopia and all the U2.com crew who have so graciously supported us! So, what is the #U2CB (as it’s become known in the Twitterverse)? Basically, it’s me, Tim Neufeld, and a virtual community of passionate people. In this little digital sphere of fandom, I use the Periscope app to engage anyone interested in talking about U2. In the real world, I’m a professor of biblical studies at Fresno Pacific University, where I teach a course called “Theology, Culture and U2.” I’m also on staff with atu2.com, and I’m writing a book (out in fall of 2016 through Rowman and Littlefield) about the interplay of U2 and culture. Some fans have cheekily renamed me as the “@U2Professor,” which is quite humbling—I’m not worthy! The Crystal Ballroom is an organic experience that has evolved purely by chance. After attending the second concert in San Jose, California, on May 19, I had a three-hour drive back to Fresno. I had already seen both Vancouver shows and loved them, so on a whim, I had my wife, Tracy, open up the Periscope app and start broadcasting with the simple title of “U2”. You know that feeling when you leave a U2 concert and you immediately want to talk with someone else who has also been at the concert, trying to remember all the details before they become quickly fading memories? That was me and Tracy on the long, late-night drive home. About 20 or 30 people hung out with us for a couple of hours online that night, though more than 100 had popped into the conversation for at least a few minutes. I was actually quite surprised by the number of viewers. So, when the Phoenix concerts rolled around a few days later, I started another broadcast from my home in Fresno as soon as the first show was over, this time with the title, “Anyone want to talk about U2?” As unsophisticated and simple as it was, people really seemed interested in chatting about this tour. The Crystal Ballroom (though not yet known by that name) has also broadcast from #U2ieTour live shows, which has helped greatly in gathering viewers. We were a little worried in Los Angeles when we first tried that because no one had done that before—we weren’t sure if we’d get in trouble. Bono though gave a shout out to Periscopers in the house during the Meerkat feature from Boston and soon after the Crystal Ballroom even caught the attention of a German radio news station who did an NPR-style story on us! After one of the other LA shows, I streamed another post-concert broadcast with the title, “U2 chat in the Crystal Ballroom,” a clear nod to the song of the same title. It stuck. Since then, I’ve incorporated music, visuals and other support material. I’ve even included guests like Matt McGee (the founder of atu2.com), Beth Nabi and Chris LeClere (who together make up the U2 Tattoo Project), Mirrorball man Mark Baker and Bigwave here in Zootopia. I try to stream a chat after every concert, though it doesn’t always happen on the European leg due to my work schedule. We celebrated our 50th post-concert chat a couple of weeks ago. That’s something I never could have predicted, especially since the technology for this kind of experience didn’t even exist nine months ago. At the Madison Square Garden shows, I met many U2 fans from around the world who had regularly tuned into the broadcasts. Besides North America, we have “Crystalheadz” across the globe now in Holland, England, Australia, New Zealand, Brazil, Mexico, France, Italy, Greece, Ireland and many other distant places. It’s become an amazing international community, usually with hundreds of participants per broadcast. And while we really don’t have a staff (though “Mrs. Crystal Ballroom” is a big part of it), we recently had a meetup in California which brought out some great supporters. Specifically, Suzen Avakian, Jeff Long and Tesh Ewing took the lead, planning a great celebration for 25 excited U2 fans (we were supposed to have more, but our weekend coincided with the tragic Paris attacks, causing some to change plans). It was the first real-life gathering of our virtual community. I hope there will be many more. In the Crystal Ballroom we are trying to do four things: (1) create community by pulling down the dividing walls, (2) build a learning environment where everyone can contribute to the discussion, (3) promote active engagement on important issues such as the refugee crisis in Europe, and (4) consider U2’s own music, art, activism and spirituality. That all sounds a bit stuffy, and sometimes it’s quite solemn, but usually we have a lot of fun. It’s become another way we get to carry each other. After all, U2 makes it easy, giving us a great time alongside challenging and provocative issues. That’s what sets this band apart from all others. This is so amazing Tim! 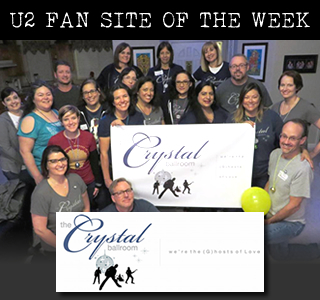 I just wanted to say thank you U2.com and Zootopia for the most amazing pick for Fan Site of the week.....I had the pleasure to meet some of the Crystal Heads this past weekend and they all left a mark on my U2 soul. 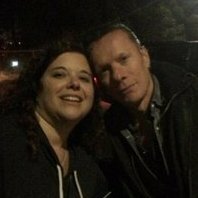 Thank you Tim for taking time out of your day to spend with the Crytal Ballroom and allowing us all to meet each other....many thanks to Tracy also! Keep up the good work. You do a fabulous job. I love going to the Crystal Ballroom. Thank you Tim & Tracy Neufeld for the amazing Crystal Ballroom. 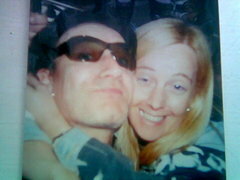 What an honor to be a part of such a fantastic U2 virtual community. What a blessing to be able to meet some of our CA Crystalheadz recently!! Hope we can gather again soon. 2016 U2 shows... Plz!!!!!! THE BEST. <3 Tim and co -- great, deep and insightful convo. As one of the original Cystalheadz to the CB chatroom, it is always insightful and fun to learn about our favorite band all the while dissecting the music lyrics with an interesting perspectives from other fans. Keep the broadcasts coming, Tim. We will all gladly meet in the ballroom for years to come!